‘Bitcoins’ is a term cropping up more and more in the world of business and finance but a lot of people are still unaware of it or are yet to know what it actually is or how it works. With their growing prominence and importance; hopefully this will make things a little clearer. Bitcoin is a form of decentralised, online, electronic currency that was launched in 2009. It is not actually available in physical form but is instead administered by a peer-to-peer system. This means it uses the internet to pass between personal computers that are linked via a network. The virtual currency is believed to have emerged following the crash of the global economy in 2008, as a response to the growing plight of many existing currencies. Now available internationally, the currency has seen a recent boost in interest; so much so that in February 2013, Bitcoins were said to have a value of £180 million. Bitcoins are not operated like other currencies in that there is not one main headquarters you can go to where production and organisation takes place. Since it is shared using a peer-to-peer network, Bitcoins are stored all over the world. They are ultimately created using a process called mining, where computers must solve hugely difficult mathematical problems; meaning extensive technology and electricity are required to produce them. This was a deliberate design technique, aimed at limiting the amount that can be produced, therefore controlling inflation while also eliminating governmental ability to influence the value of the currency like they can with others. The more Bitcoins that get produced, the more complex the mathematical problems become to create them; this stops businesses generating huge amounts of them in too short a space of time. The system may sound confusing but this is necessary to protect the currency and ensure its longevity. The most popular method for buying Bitcoins is to use an exchange, where funds are transferred from your bank while the Bitcoins are sent to your computer. Currently, the largest and most trusted exchange is called ‘MtGox’. Many people just search online to find private sellers, with whom you would organise payment individually. It is very rare to find outlets that will accept payment via PayPal. It is technically possible but the terms and conditions of PayPal state that they are against the use of digital currencies and since they too are a form on instant, online payment are actually in direct competition with Bitcoins, so choose not to actively support them. 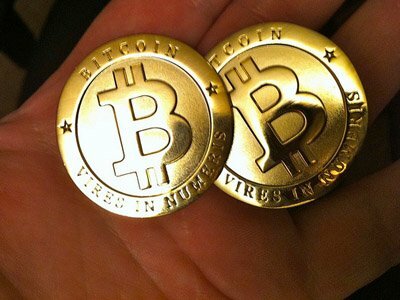 Due to their very online nature, Bitcoins have already been subject to hacking and problems with sudden drops in value. However, with the ever growing prominence of online transactions and the fragile state of other currencies such as the Euro; with a little more time to find its feet and solidify its place on the market, it could see further growth and continue its reign as the leader in alternative payment methods. Some businesses and websites have already started accepting them and a man in Canada is hoping to become the first person to sell his house using only Bitcoins as payment. This all certainly suggests that Bitcoins are growing in their following, usage and reliability, with the potential to flourish into a fully-fledged, universal currency in the not too distant future. So while you should be careful where you buy them from, Bitcoins may just be worth getting your hands on if you can.